Not just reheat-and-eat night, but let’s talk getting creative with leftovers. What have you come up with? Anything great? 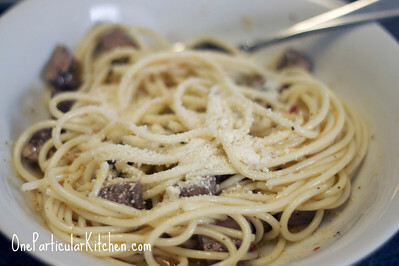 This is my new favorite: Italian steak pasta! Sunday night was steak night. Monday night was spaghetti. So Tuesday night I sliced up the remaining steak, mixed it in with pasta and some Italian dressing (Ken’s, specifically, because I love it) , and topped it all with parmesan cheese. This was SO good! Your turn! What have you come up with? Looks great! Pasta is a great vehicle for reinventing leftovers. I just made this dish: http://brannyboilsover.wordpress.com/2009/04/23/manfood/ with leftover veggies from a stir fry meal. Yum! This “leftover” creation was better than the first incarnation. one of my hubby chef’s favorite is to make Egg Foo Yong with leftovers. Any kinds of meat will do, sometimes he uses leftover stir frys to make it too. Just add a few fresh veg., some bean sprouts and eggs. I love hashes- leftover potatoes or sweet potatoes, any veggies you have in the fridge, and leftover meat (or none), toss it in a pan and get everything nice and toasty. My favorite is sweet potatoes, chorizo, onions and mushrooms, with cheddar over top (and an egg on top for breakfast the next day). Hi, I love following your blog! Here’s a recipe my husband made one night from leftovers. It was very yummy! I love reinventing dishes with leftovers and random ingredients – great job!! These are all great suggestions! I love ’em! This looks sooooooooooooo good!!! Way to use up the leftovers!